I had the pleasure of photographing a "brand new" client and a set of clients that I have had the time of my life photographing in the past. However two sessions later I did feel like I was in my car all day (I was) thanks to the wonderful road planning by the Illinois Dept of Transportation. A word to the wise, avoid northbound I-294 from the hours of, well, almost always... The construction zone around O'Hare is, in a word, rough. My clients however were a PLEASURE to get to know and photography. MK is a brand new baby girl, just a few weeks old. She's been having fun with "daddy watch" nights, keeping her daddy, R, up all night the night before our shoot. (On one hand HE probably was thankful for the additional naptime my O'Hare construction zone lateness resulted in!!) ((sigh)) I remember, almost all too well, those sleepless newborn nights. MK is a doll, a sweet baby with a quiet disposition. She seemed extremely content. I also met MK's grandmother, whom I swear is the best looking and youngest grandmother EVER....and most of all, W, MK's mom...who has an enviable sense of family history. She was positively inspirtational in her decor of her home with family heirlooms. I love clients who have a tie to the past and she is truly the finest example of that. 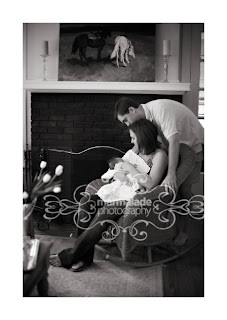 Here are a few sneak peeks of Marmalade Photography's session with MK. Enjoy!